What’s the difference between a handyman and a professional house painter? Does it matter which one paints your home? As we covered previously, it’s very important right now that you understand exactly what a professional house painter is. Anyone that shows up to your home armed with a paint sprayer and wearing old clothes covered in paint is not necessarily a house painter. It means that they have some of the tools of the trade, and they may have painted a few houses, but it doesn’t necessarily mean that they are qualified to paint your house. When you hire a professional house painter you should expect a high standard of work, and the best part is that if they don’t provide it then you have options available to you to get your money back. If you hire a handyman and aren’t satisfied with their work, then good luck getting your money back from them. On the other hand, when you hire a professional house painter you can always file a complaint with the Registrar of contractors to get your money back. In all honesty, though it’s highly unlikely that things ever escalate to this point. Most painting contractors are fully aware of the fact that their reputation is extremely important to them. The last thing they want to happen is to have a complaint filed against them that could impact their future ability to attract new business. Hiring a professional house painter also protects you financially in the event that there is some kind of accident while they are painting your house. What happens if the person painting your house damages it? Or what if they get injured on the job? Well, if you’ve hired a licensed, bonded, and insured painting contractor you are covered. On the other hand, if you’ve hired anyone lacking these credentials then you could be looking at some pretty significant out of pocket expenses in the near future. The last reason you should always use a professional house painter is that they are going to do better work than an amateur or handyman. This is their business, it’s what they do, and because of that, they are experts. This is also your home we are talking about here, so you shouldn’t just want the best possible paint job for it, you should demand it. The only way you are going to get that standard of work is by entrusting a professional to paint your house. 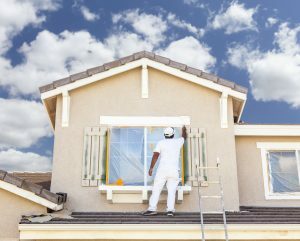 So, do yourself a favor, if you are ready to have your home painted then hire a professional painting contractor to do it for you.